Adsorptive removal of arsenic using adsorption gels prepared from orange and apple juice residues was reviewed by summarizing the authors’ previous papers. Orange and apple juice residues contain a large amount of pectin, partly methyl-esterified pectic acid, which exhibits high affinity for high-valent metal ions such as iron(III), rare earths(III) and zirconium(IV). Anionic species of arsenic(III, V) are effectively and selectively adsorbed on pectic acid gel via loading these high-valent metal ions. Raw orange juice residue was saponified using calcium hydroxide to improve the loading capacity for these metal ions. It was found that zirconium(IV) exhibits the most suitable adsorption behaviors for arsenic(III, V). Similar result was obtained also for apple juice residue. An actual sample of acid mine drainage from the Horobetsu mine which contained a high concentration of iron and low concentration of arsenic, was tested using the adsorption gel prepared from orange juice residue and the results were compared with those from the current treatment process based on coprecipitation with iron hydroxide. The new process using the above- mentioned adsorption gel was proposed for treatment of such acid mine drainage. Arsenic is an element belonging to group 15, the nitrogen family, in the periodic table together with nitrogen, phosphorus, antimony, and bismuth. Its main valencies are 3 and 5 and it exists as oxo-anions, arsenate and arsenite, respectively, in nature. Although organic arsenic compounds contained in various marine products such as fishes and sea-weeds are non-toxic and have been eaten by human beings since ancient times, inorganic arsenic is toxic, and arsenite is more toxic than arsenate. Soluble arsenite and arsenate have immediate toxic effects. Long-term exposure to arsenic in drinking water can cause cancer of the skin, lungs, bladder and kidney  . Since arsenic is a relatively abundant element, with a content of around 1.5 mg∙kg−1 or 0.0005% in the earth’s crust, there are many districts where high content of arsenic occurs in soils and subsoil waters. It is introduced into water not only through natural sources such as volcanic emissions, dissolution of mineral ores, and atmospheric decomposition etc. but also through anthropogenic sources such as non-ferrous smelting, petroleum-refining, fossil fuel power plants  and so forth. Naturally occurring arsenic is of great concern in some regions of Bangladesh, India, Nepal and China, where ground waters contaminated with arsenic have been used as drinking water. In these areas, hazardous concentrations of arsenic have appeared as a result of strong water-rock interactions and the physical and geochemical conditions for arsenic mobilization in aquifers  . Additionally, acid mine drainage containing arsenic is also a serious environmental problem in some area, and this will be mentioned in detail later. Since 1993, the World Health Organization (WHO) has recommended a maximum contaminant level for arsenic of 10 μg∙dm−3 in drinking water. In order to clear such environmental standards for arsenic, numerous treatment techniques such as co-precipitation, ion exchange, ultrafiltration, and adsorption have been proposed and some of them have been used on a commercial scale. Scheme 1. Flowsheet of the process for neutralization and removal of arsenic from acid drainage at Horobetsu closed sulfur mine in Hokkaido, Japan  . economical and more environmentally benign treatment processes are strongly required. For the adsorptive removal of anionic species of arsenic, the use of cation exchange materials such as strongly acidic cation exchange resins loaded with high-valent metal cations such as ferric ions exhibiting a high affinity for the anionic species in question has been proposed  . The mechanism of adsorption of the dihydrogen arsenate ion ( H 2 AsO 4 − ) on a sulfonic acid-type strongly acidic cation exchange resin loaded with ferric ion (Fe3+) is shown schematically in Scheme 2 as a typical example. In this case, among the 3 positive charges on the ferric ion, only one is neutralized by a sulfonic acid functional group; it is difficult for the other sulfonic groups to approach the ferric ion because of the strong steric hindrance of crosslinked matrices, i.e. crosslinked polystyrene in this case. The other 2 positive charges on the ferric ion are neutralized by anionic species in the aqueous solution such as hydroxyl ions. Such anionic species are substituted by other anionic species such as arsenate and arsenite. Consequently, these anionic species can be easily adsorbed and desorbed by changing the pH. For the purpose of developing more environmentally benign techniques for removing and recovering these anionic species, we have studied environmentally benign new adsorption materials using natural biomass wastes instead of synthetic materials such as ion exchange resins produced from petroleum. There are a variety of natural organic polymeric materials with functionalities for adsorbing cationic metal ions in nature: acidic polysaccharides such as alginic acid and pectic acid  , basic polysaccharides such as chitosan  and various proteins  . Furthermore, adsorption using various biomass wastes has attracted great attention in recent years  . Scheme 2. Mechanism of arsenate on iron (III)-loaded strongly acidic cation exchange resin. Scheme 3. Chemical structures of some polysaccharides. also shown in Scheme 3. It is easily saponified by alkalis such as sodium hydroxide and calcium hydroxide, as shown in Scheme 5. As shown in Scheme 4, divalent metal ions such as calcium(II) form stable 5-membered chelates with alginic acid and pectic acid by coordination with the oxygen atoms of the carboxylic groups and pyranose rings of the polysaccharide, as well as the ether oxygens between the pyranose rings. Scheme 4. Structure of calcium(II) alginate (egg box structure). Scheme 5. Saponification reaction of pectin using calcium hydroxide. Figure 1 shows the % adsorption of some metal ions on pectic acid crosslinked using formaldehyde from aqueous solution at equilibrium at various pH values  , where % adsorption denotes the extent of adsorption and is defined by the following equation. As seen from this figure, the adsorption increases with increasing pH, which suggests that adsorption of cationic metal ions takes place by cation exchange between metal ions and hydrogen atoms of carboxylic groups. In such adsorption of metal ions based on a cation exchange mechanism, the 2 positive charges on the divalent metal ions are neutralized by 2 carboxylic groups of these acidic polysaccharides, as shown in Scheme 4. However, in the cases of high-valent metal ions such as trivalent and tetravalent metal ions, it is difficult for all the positive charges (+3 and +4) to be neutralized only by carboxylic groups because of the strong steric hindrance in acidic polysaccharides, crosslinked polysaccharides in particular, similar to the cases of synthetic cation exchange resins, as mentioned earlier. In such cases, the positive charges which are not neutralized by carboxylic groups are neutralized by anionic species existing in aqueous solution such as hydroxyl ions also similar to the cases mentioned earlier. These anionic species are easily exchanged by other anionic species such as arsenate and arsenite. Figure 1. % adsorption of some metal ions on pectic acid crosslinked using formaldehyde from aqueous solution at various pH values  (Reproduced with permission from The Society of Chemical Engineers, Japan). Figure 2. Adsorption amount of arsenic(V) (q) on pectic acid gel crosslinked using formaldehyde loaded with iron (III) at various equilibrium pH values. Initial arsenic concentration = 15 mg∙dm−3, temperature = 30˚C  (Reproduced with permission from The Society of Chemical Engineers, Japan). gel crosslinked using formaldehyde loaded with iron(III) at pH 2 and 3  . Here, the amount of adsorption was evaluated as follows. Figure 3. Adsorption amount of arsenic(III) (q) on pectic acid gel crosslinked using formaldehyde loaded with iron(III) at various equilibrium pH values. Initial arsenic concentration = 15 mg∙dm−3, temperature = 30˚C  (Reproduced with permission from The Society of Chemical Engineers, Japan). Figure 4. Distribution of arsenite [As(III)] species at various pH values. Figure 5. Effect of coexisting anionic species on the adsorption of arsenic(V) on pectic acid gel crosslinked using formaldehyde loaded with iron(III) at pH 3 at various equilibrium pH values  (Reproduced with permission from The Society of Chemical Engineers, Japan). chloride and sulfate ions only negligibly influences the adsorption of arsenic(V). A similar result was observed also in the case of the adsorption of arsenic(III). Hence, it can be concluded that an iron(III)-loaded pectic acid gel exhibits a high selectivity for arsenic(V and III). Figure 6 shows a comparison of the amount of adsorption of arsenic(V) on a commercially available adsorbent, Unicelex UR-3700, which is a plastic porous resins containing fine powders of hydroxyl ferric oxide, with that on crosslinked pectic acid gel loaded with iron(III) at various equilibrium pH values. As seen from this figure, the crosslinked pectic acid gel, prepared from a natural material, gives a higher adsorption than the commercially available synthetic resin prepared from petroleum. In both figures, the adsorption decreases with increasing pH at pH higher than 8 which is attributable to the increased concentration of hydroxyl ions, which compete with anionic arsenic species, as shown in Scheme 2. The decreasing adsorption of arsenite with decreasing pH at pH lower than 8 in Figure 3 is considered to be attributable to a decrease in the fraction of dissociated H 2 AsO 3 − species, or an increase in the concentrations of undissociated H3AsO3 species, which do not interact with the loaded iron(III) ions as shown in Figure 4. However, the adsorption of arsenate [As(V)] shown in Figure 2, is complicate, i.e., the adsorption decreases with increasing pH at pH lower than 5 while it increases with increasing pH at pH higher than 5 and again decreases at pH higher than 8. In both Figure 2 and Figure 3, the adsorption on the gel loaded with iron(III) at pH 3 is lower than that loaded at pH 2, which is considered to be attributable to the following. Since iron(III) is easily hydrolyzed even at low pH, some portion of the iron(III) loaded at pH 3 is hydrolyzed to fine particles of ferric hydroxide and drops off from the gel, resulting in a decrease in the amount of loaded iron(III) ions, causing a decrease in the adsorption of both arsenate and arsenite. Although, as demonstrated above, crosslinked pectic acid gel exhibits good adsorption for arsenic, it is expensive to commercially produce the gel using pure pectic acid. Consequently, we hit upon the idea of preparing similar gels using biomass wastes containing large amount of pectic acid at low cost. One candidate biomass wastes was orange juice residue. Figure 6. Amount of adsorption of arsenic (V) on commercially available adsorbent, Unicelex UR-3700, ( ) and that on crosslinked pectic acid gel loaded with iron(III) (●) at various equilibrium pH values. Scheme 6. 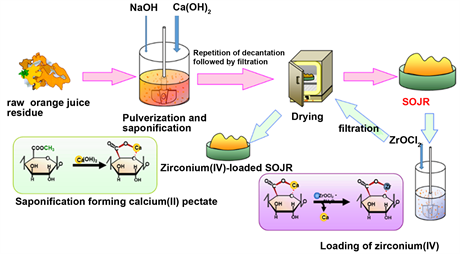 Preparation of saponified orange juice residue (SOJR) gel and zirconium (IV)-loaded SOJR gel. as mentioned earlier. To prepare the adsorption gel, OJR was treated with calcium hydroxide to increase the amount of carboxylic acid functional groups, to improve the adsorption capacity for metal ions, by the saponification reaction shown in Scheme 5, as in the following example. About 100 g of OJR, just after juicing, along with 8 g of calcium hydroxide were pulverized into small particles in a juicer mixer. The resulting mixture was transferred into a beaker, and a substantial amount of water was added. The mixture was stirred for 24 h at about 200 rpm at room temperature to facilitate the saponification reaction. Here, the initial pH of the mixture was maintained at around 12.5 by adding sodium hydroxide solution. After decantation, the mixture was repeatedly washed with water and decanted until neutral pH. Here, water washing is important because orange juice residue contains citric acid, which functions as a water-soluble chelating agent, impeding adsorption of metal ions or eluting the loaded metal ions. The mixture was finally filtered to obtain wet gel, which was dried in a convection oven for about 48 h at 70˚C to obtain a dry gel. Thus prepared dry gel is abbreviated as SOJR (Saponified Orange Juice Residue), hereafter. Figure 7 shows a scanning electron microscope (SEM) image of the prepared SOJR. The specific surface area of this gel was measured to be 7.25 m2∙g−1. In the SOJR, pectic acid is present as calcium pectinate, which can be converted into the free acid form, for example, by washing with 0.1 mol∙dm−3 hydrochloric acid followed by washing with water until neutral pH. The prepared free acid form of the SOJR was found to contain 2.69 mol∙kg−1 of hydrogen ions while the gel prepared from pure pectic acid gel, mentioned earlier, was found to contain 5.65 mol∙kg−1 of free hydrogen ions, which suggests that a much cheaper adsorbent possessing the same functional groups can be produced from biomass waste  . Figure 8 shows the adsorption behavior of the SOJR gel for some metal ions as plots of % adsorption vs equilibrium pH  . As seen from this figure, zirconium(IV), iron(III), lead(II) and copper(II) are selectively and strongly adsorbed on this gel. Iron(III) was found to be adsorbed according to the Langmuir’s adsorption isotherm, from which the maximum adsorption capacity for iron(III) was evaluated as 1.55 mol∙kg−1, while that on the crosslinked pectic acid gel was evaluated as 0.57 mol∙kg−1, which is inferred to be attributable to the effect of calcium(II) ions in the SOJR gel, i.e., it is inferred that iron(III) ions were hydrolyzed to fine particles of ferric hydroxide, which remain in the SOJR gel. A similar adsorption gel was prepared also from apple juice residue  . Figure 9 shows the removal % or % adsorption of arsenic(III and V) using iron(III)-loaded SOJR gel at various pH values, and removal of arsenic(V) by a conventional coprecipitation method with iron(III) for comparison. As seen from this figure, arsenic(V) can be nearly quantitatively removed over a wide pH range (pH 2 - 6). More than 80% of arsenic(III) can be removed at pH 7 - 9 using iron(III)-loaded SOJR gel, while the conventional coprecipitation method using iron(III) chloride can remove more than 80% of arsenic(V) only in a relatively narrow pH range (pH 5 - 6). Figure 7. Scanning electron microscope image of SOJR gel. Figure 8. % adsorption (R%) of some metal ions on SOJR gel at various equilibrium pH values  . Figure 9. Removal % or % adsorption of arsenic(III and V) using iron(III)-loaded SOJR gel and removal of arsenic(V) by a coprecipitation method with iron(III) at various pH values. ●: removal of arsenic(V) using iron(III)-loaded SOJR gel, □: removal of arsenic(III) using iron(III)-loaded SOJR gel, ? : removal of arsenic(V) by means of coprecipitation method using iron(III) chloride  (Reproduced with permission from The Mining and Materials Processing Institute of Japan). loaded metal ions  . As can be seen from this figure, the effect of the pH differs greatly depending on the loaded metal ions for both arsenic(III) and arsenic(V). Zirconium(IV)-loaded SOJR can remove both arsenic species over a wider pH range than iron(III)- and cerium(III)-loaded SOJR gels, suggesting that zirconium(IV) is the most suitable loaded metal ion on the SOJR gel. Figure 10. % adsorption of arsenic(V) on SOJR gel loaded with iron(III), cerium(III) or zirconium(IV) at various equilibrium pH values  . Figure 11. % adsorption of arsenic(III) on SOJR gel loaded with iron(III), cerium(III) or zirconium(IV) at various equilibrium pH values  . although some portions of the loaded iron(III) and cerium(III) leak from the SOJR gel, at low pH in particular, the leakage of zirconium(IV) is negligible. Figure 13 and Figure 14 show the effects of other anionic species, namely chloride, sulfate and carbonate, which usually coexist together with arsenic in actual aqueous solutions, on the % adsorption of arsenic(V) and arsenic(III), respectively, on zirconium(IV)-loaded SOJR gel at various pH values  . As can be seen from these figures, excess concentrations of these coexisting anionic species only negligibly influence the adsorption of both arsenic(V) and arsenic(III), suggesting high selectivity of this adsorbent for arsenic. Figure 12. % leakage of loaded metal ions from SOJR gel at various equilibrium pH values  . Figure 13. % adsorption of arsenic(V) on SOJR gel loaded with zirconium(IV) ions from aqueous solutions containing arsenic(V) and about 10-fold excess concentrations of chloride, sulfate and carbonate  . Figure 14. % adsorption of arsenic(III) on SOJR gel loaded with zirconium(IV) ions from aqueous solutions containing arsenic(III) and about 10-fold excess concentrations of chloride, sulfate and carbonate  . Figure 15. Adsorption isotherms of arsenic(V and III) on zirconium(IV)-loaded SOJR gel (Zr-SOJR) and on zirconium ferrite (Zr-Fe). (Zr-Fe), a commercially available inorganic adsorbent, the chemical composition of which is ZrFe2(OH)8. All the adsorption isotherms in this figure are the Langmuir-type adsorption isotherm; the constant values of the plateau regions of these isotherms were used to evaluate the maximum adsorption capacities for arsenic(III and V), as shown in this figure. It is obvious from this figure that the adsorption capacities on zirconium(IV)-loaded SOJR gel are higher than that on commercially available zirconium ferrite for both arsenic(III) and arsenic(V) and that the adsorption capacities for arsenic(III) are higher than those for arsenic(V) for both adsorbent. These values are also listed in Table 1 together with values reported in the literatures for comparison. On the basis of the information on the fundamental adsorption behavior for anionic species of arsenic(V and III) obtained by batch-wise experiments, continuous adsorption followed by elution tests were carried out using a glass column shown in Figure 16. Figure 17 shows breakthrough profiles of arsenic(V) and arsenic(III) from a column packed with zirconium(IV)-loaded SOJR gel for individual feed solutions of arsenic(V) and arsenic(III) under the condition given in the figure legend. In this figure, the ordinate denotes the ratio of the outlet concentration (C) to the inlet concentration (C0) and the abscissa denotes the bed volume (B.V.), which is defined as the ratio of the volume of feed solution which passed through the adsorption bed packed in the column to the volume of adsorbent packed in the column (i.e. the contact time during adsorption or elution). Both arsenic species can be completely removed until about 600 B.V. Figure 18 shows the elution profiles of arsenic(III and V) using 0.5 mol∙dm−3 sodium hydroxide solution from the loaded column after the complete breakthrough shown in Figure 17. From this figure, it is evident that arsenic(V) and arsenic(III) are eluted from the column within a short time, at concentration as high as 80 and 25 times, respectively, that of the feed concentration. Table 1. Comparison of maximum adsorption capacities for arsenic(III and V) on some adsorbents. Figure 16. Schematic diagram of the glass column employed in the experiments for continuous adsorption followed by elution. Figure 19 shows the results of cyclic operation of adsorption of arsenic(V) followed by elution using 0.5 mol∙dm−3 sodium hydroxide solution by a column packed with zirconium(IV)-loaded SOJR gel up to 5 cycles. Although both the % adsorption and elution are slightly lower after the second cycle, they are still higher than 80%, suggesting high durability of the zirconium(IV)-loaded SOJR gel for repeated use for a long time. Figure 17. Examples of breakthrough profiles of arsenic(III and V) from the packed column shown in Figure 16. Conditions: feed concentration (C0) = 4.8 mg∙dm−3, dry weight of the packed gel = 0.1 g, feed rate = 6.5 cm3∙h−1 for arsenic(V), 3.3 cm3∙h−1 for arsenic(III), and pH of the feed solution = 3.3 for arsenic(V) and 9.1 for arsenic(III)  . Figure 18. Elution profiles of arsenic(III and V) from the loaded column after the break through shown in Figure 17  . Figure 19. Results of cyclic operation of adsorption of arsenic(V) followed by elution using a column packed with zirconium(IV)-loaded SOJR gel  . Figure 20. Removal of arsenic from actual acid mine drainage at Horobetsu mine in Hokkaido, Japan, by conventional coprecipitation method and adsorption using SOJR gel, as plots of arsenic concentration after the treatments vs pH  (Reproduced with permission from The Mining and Materials Processing Institute of Japan). Scheme 7. Schematic flowsheets of processes for arsenic removal from acid mine drain age from Horobetsu mine: (a) Currently used process; (b) New process using SOJR gel. The effectiveness of the SOJR gel was further confirmed by testing the removal of arsenic from an actual solution using arsenic-containing acid mine drainage from the Horobetsu mine mentioned in the Introduction  . Since, as mentioned earlier, this solution contains a high concentration of iron (total iron concentration = 336 mg∙dm−3), increasing the pH results in formation of precipitates of iron hydroxide with which arsenic is coprecipitated. In this test, SOJR gel was added without loading metal ions, since a large amount of iron ion was expected to be adsorbed onto the added SOJR gel prior to the adsorption of arsenic. Figure 20 shows plots of the total concentration of arsenic after treatments using the SOJR gel and without using the gel, i.e., treatment by coprecipitation method by adding sodium hydroxide, for comparison, at various pH values. As can be seen from this figure, nearly quantitative removal of arsenic was achieved by adding SOJR gel over the whole pH range tested, including low pH values such as pH 4, while a higher concentration of arsenic still remained after the treatment without using the SOJR, or by the currently used treatment. In the currently used treatment mentioned in the Introduction, lime (calcium carbonate) and slaked lime (calcium hydroxide) are used to increase the pH value since the pH value in the feed solution is as low as 1.8. Consequently, the addition of lime and slaked lime results in the generation of a huge amount of precipitated water-insoluble gypsum (calcium sulfate) since the solution also contains a high concentration of sulfate (2510 mg∙dm−3). Arsenic coprecipitated onto precipitates of iron hydroxide is dumped together with this huge amount of gypsum after dewatering using filter press machines at special dumping sites. If arsenic were removed in advance prior to neutralization of the acid mine drainage, the gypsum would be free from arsenic contamination and able to be marketed as feed materials for cement and construction materials such as gypsum board as illustrated in Scheme 7. Environmentally benign adsorption gel was found to be prepared in a simple manner from juice residues of oranges and apples. By loading high-valent metal ions such as iron(III), rare earths(III) and zirconium(IV) on these gels, low or trace concentrations of arsenic(III and IV) was effectively and selectively removed from water. Among these loaded high-valent metal ions, zirconium(IV) was found to be the most suitable. The effectiveness of such metal-loaded gel was verified for the actual solution of acid mine drainage. 3. Huang, C.P. and Fu, P.L.K. (1984) Treatment of Arsenic(V)-Containing Water by the Activated Carbon Process. Journal of Water Pollution Control Federation, 56, 233-242. 5. Twindwell, L.G., Robins, R.G. and Hohn, J.W. (2005) The Removal of Arsenic from Aqueous Solution by Coprecipitation with Iron(III) In: Reddy, R.G. and Ramachandran, V., Eds., Arsenic Metallurgy, The Minerals, Metals & Materials Society (TMS), John Wiley & Sons, Inc. Warrendale, PA, 3-24. 15. Inoue, K., Ghimire, K.N. and Makino, K. (2003) Removal of Impurity Metal Ions from Waste Plating Solutions by Using Orange and Apple Juice Residues. In: Schlesinger, M.E., Ed., EPD Congress 2003, The Minerals, Metals & Materials Society (TMS), Warrendale, 525-535. 16. Inoue, K. (2008) Adsorptive Removal of Hazardous Inorganic Elements from Water by Using Orange Waste. Indonesian Journal of Chemistry, 8, 293-299. 18. Gupta, S.K. and Chen, K.Y. (1978) Arsenic Removal by Adsorption. Journal of the Water Pollution Control Federation, 50, 493-506.